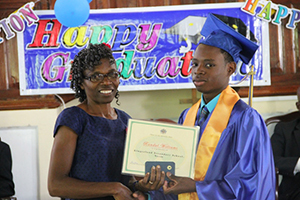 NIA CHARLESTOWN NEVIS (November 28, 2014) — Randal Williams Valedictorian for the 2014 Caribbean Certificate of Secondary Level Competence (CCSLC) examinations students of the Gingerland Secondary School (GSS), expressed thanks to God and his family who he said saw him through his years at the School. 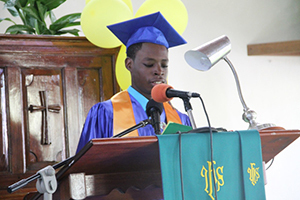 He encapsulated his feelings in a short but poignant presentation at the school’s 41st annual Graduating Ceremony at the Gingerland Methodist Church on November 27, 2014. “What a mighty God we serve! Thanks to God, my father for bringing me this far. I also want to thank my family, friends, church and teachers for their love and support. Special thanks to my mother, grandmother, sister, uncle, aunty and cousins who never gave up on me. Mommy I wish you were here. “I can do all things through Christ who gives me strength. You too can make it! My God is awesome and I thank you,” he said. Williams emerged the GSS top student in the 2014 CCSLC examinations with four subject passes. A total of 94 students graduated at the Ceremony which was held under the theme “Restoring our values: Respect Discipline, Compassion, Love for Another”. The Patron was Jennifer Liburd.